The FL46300 Series of liquid in-line flow meters offer individual, handmade quality, combined with excellent accuracy and repeatability. 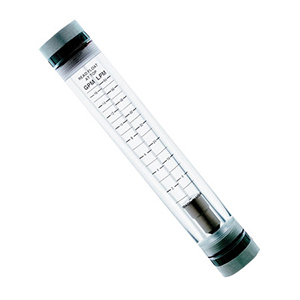 These flowmeters are machined of high quality acrylic rod stock, carefully polished to a clear-as-glass finish. Easy to read scales are screen printed on the meter body. Adaptors are glass-filled polypropylene, and O-ring seals are FKM. 참고: * These units have aluminum stress rings on end fittings for added strength. For 5-point NIST calibration, add suffix "-NIST" to model number; add $375.00 to price and two weeks to the delivery.